The fixes: When I went to find the mats I discovered my stuff was broken so I had to remake the original Startaur for Chiptaur using an older file. While I was at it, I also created a Startaur Unicorn and a new Startaur for the A3 Millennial Foal Centaur Body. THIS HERE IS MY README FILE. If you're not sure you're going to remember, try copy and paste into notepad or something. I sincerely despise making readme files, weeding them out when I install objects, and finding them cluttering my runtime. So this is my readme file. ***This is not a conforming object. *** I tried. I failed. It parents to the hip and you do things the old-fashioned way. I told the A3 taur body to be Triax rigged. I have no idea if morphs will hold for you. Let me know if not please, but for the record it was easier to create and you can probably just make your own if mine doesn't work. Cookietaur poses work with it, but you will have to move it around in your environment to get it back onto Star sometimes. I convince mine to behave by dropping the taur body back onto Star herself, not just the hip, which get sit closer to where I want and going from there. I've also included a Star character with her legs resized so you don't have to do all that. Star Taur looks best with smoothing turned on. Also comes with 2 coat materials. All are set for iray. spearcarrier (5 weeks ago) Inappropriate? I went to find the things to fix the things only to discover the centaur is completely broken in my computer. So I&#39;m having to hunt for the mats and redo - I may have to load the mats separately but if I can I&#39;ll simply upload a completely updated file here. DollyGirl13 (6 weeks ago) Inappropriate? spearcarrier, I am in the process of creating metadata for your lovely creation. Would it be possible to get the two texture jpgs (coat materials) you mention in the description above? Dynchia, okay. Thank you for letting me know. I'm not sure when but I plan to go back to this and work on it a little bit, see if I can improve on it. Then I will upload fixes. I'm really into Star and went so far has too buy Cookietaur just so I could use this. I do not regret the purchase, dispite the neg's I am about to post. There was no read me so it was confusing. (I could not remember what was written here in the post.) There is a thumbnail image in the DAZ Wearables but it does not show up in Studio since there is no Studio file with the same name. more …I'm really into Star and went so far has too buy Cookietaur just so I could use this. I do not regret the purchase, dispite the neg's I am about to post. There was no read me so it was confusing. (I could not remember what was written here in the post.) There is a thumbnail image in the DAZ Wearables but it does not show up in Studio since there is no Studio file with the same name. 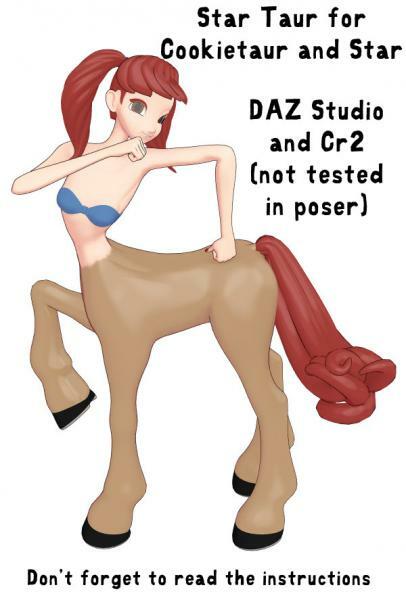 It should have been used in the Poser/Character for the Star Taur body thumbnail, not the one that's there because it clear what to do, to PARENT, NOT Conform. In the same same Studio wearable dir you have a Studio load file for Star Taur, with the Taur body as it's thumbnail, but what it loads is your modified Star body. The thumbnail should be change to show this.